Pre & Post deployment scripts can make SQL changes before and after your deployments. These scripts are managed within SQL Source Control to then be picked up when deploying with SQL Compare or SQL Change Automation. Learn more about pre & post deployment scripts. 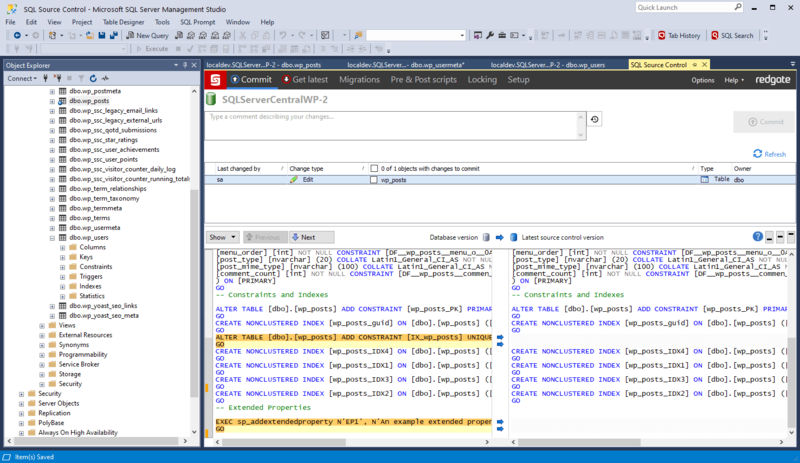 It's easy to record and share your code changes, because SQL Source Control runs inside SQL Server Management Studio. You don't have to stop what you're doing or pass round handwritten change scripts. 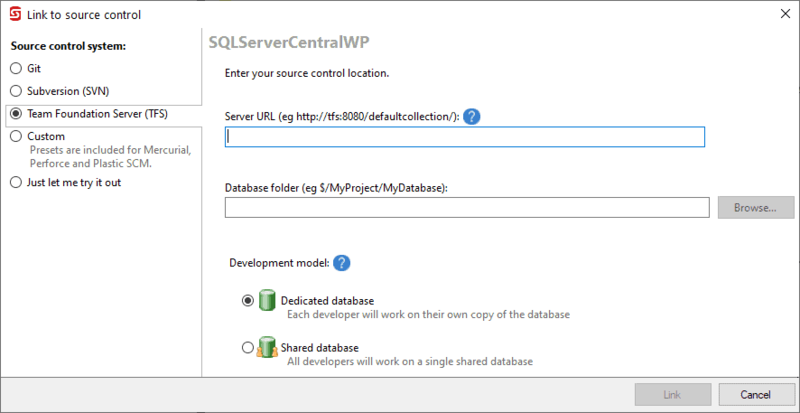 Store and share any SQL Server object and static data. 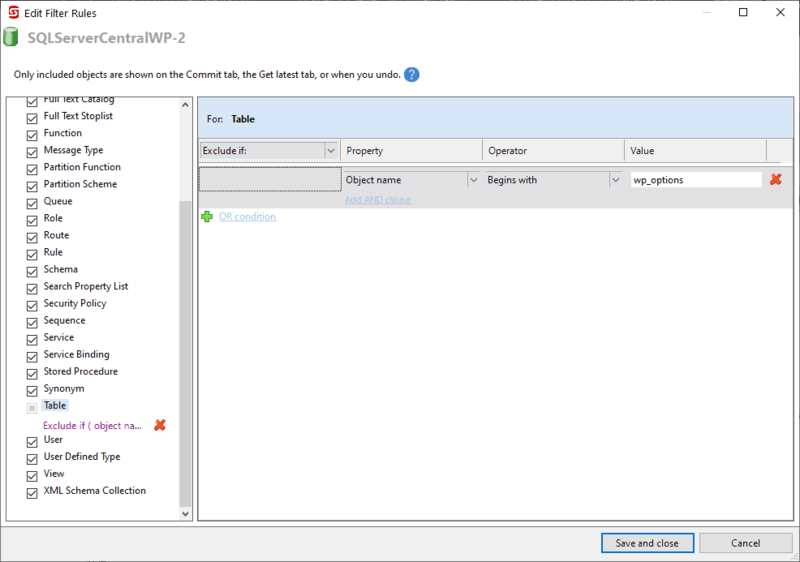 Committing and updating takes two clicks in the Object Explorer. To see what’s new, you can check changes down to the individual lines of SQL, with highlighted differences. Look through the full revision history of a database or database object. You can see who made the changes, when they made them, and why. When you commit or update, SQL Source Control maintains the referential integrity of your database for you. It works out the right order for your changes and even deals with keys and constraints. It uses the same engine as SQL Compare, the world’s most trusted tool for syncing database changes. Synchronize your local and remote Git repositories inside Management Studio. Pull down changes from your remote repository, commit your changes locally, and push straight them to your remote repository to share with the rest of your team. It's simple to roll back and resolve conflicts from the Object Explorer. This also gives you a risk-free sandbox. If you want to experiment on your database, go ahead. You can undo any changes you don't want to keep. You can lock the object you're working on in SQL Server Management Studio with just one click, so your changes are safe from being overwritten. Your team can see what's locked, as well as information on who locked it. Read more about locking in this blog post or watch the video. You and your team can work on a shared database or each use a local, dedicated copy. SQL Source Control supports both models for database development. Either way, it helps you share code, avoid conflicts, and see who’s doing what, so you can work without treading on each other’s toes. If you don't want to share certain objects, such as users or permissions, you can exclude them with filters. You can exclude objects by type, name, and owner, or specify more complex conditions. It's simple to share only what you want with your team. 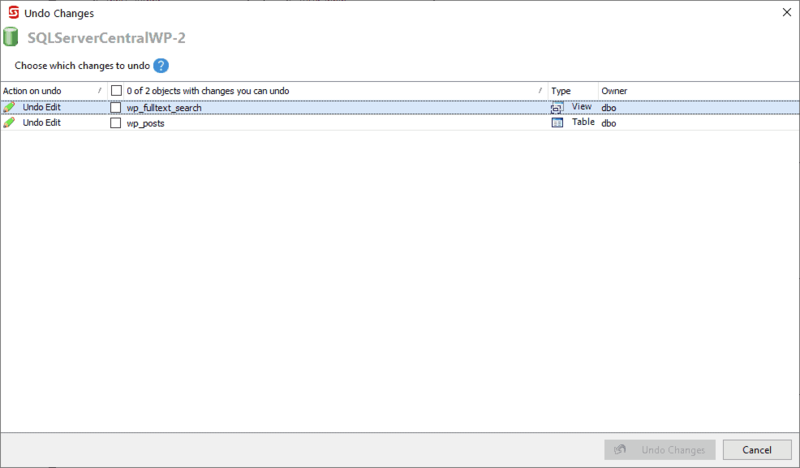 Icons in the Object Explorer show you when a change has been made to a database by you or your team. You'll never forget to commit to version control. 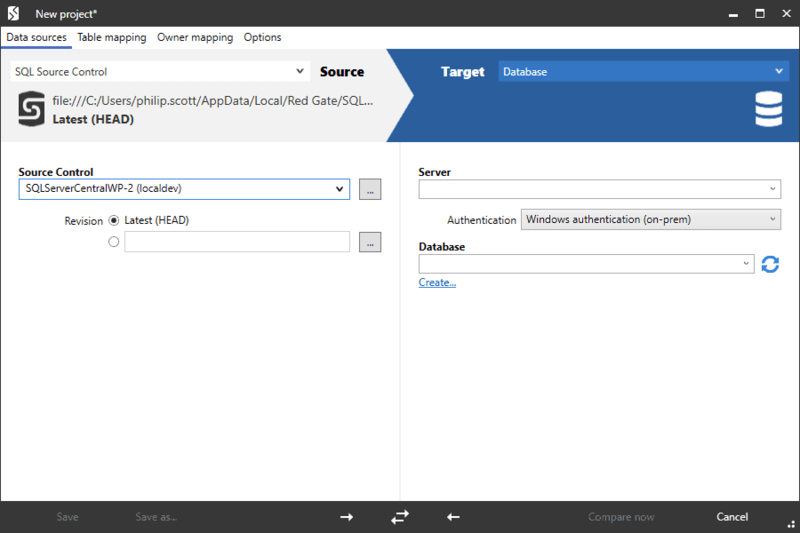 Avoid losing data during complex deployments with migration scripts. You can add these custom SQL scripts to deployment scripts generated by SQL Compare. They specify how to make the change and ensure your data stays safe. Read a walkthrough in this blog post or watch the video. Deploying database changes is nerve-wracking. You have to make certain that nothing breaks and you have to minimize downtime. When something does go wrong, you’re responsible and it can be hard to fix. So for a lot of us, deployment means queuing up changes, coming in early (or staying late), and crossing our fingers that nothing goes wrong. SQL Source Control gives you an alternative: deploy from a canonical version of your database in version control. You’re working with a stable version, which cuts the risk of deploying incomplete or incorrect changes. You can make deployments from your repository with SQL Compare Pro, or automate the process with SQL Change Automation. SQL Compare writes deployment scripts in minutes, making your release safe and efficient. You can deploy from SQL Compare or copy the script to review and run later. You can use SQL Compare to generate rollback scripts too. With SQL Change Automation, you can set up an automated deployment process for your database, using your existing release tool, such as Octopus Deploy. “I'm anxious to get SQL Source Control up and running as I know the only way to deliver high quality SQL code is by having it under a SCM tool, vigorously testing, (thank you for SQL Test) and being able to confidently and consistently build/deploy the code. 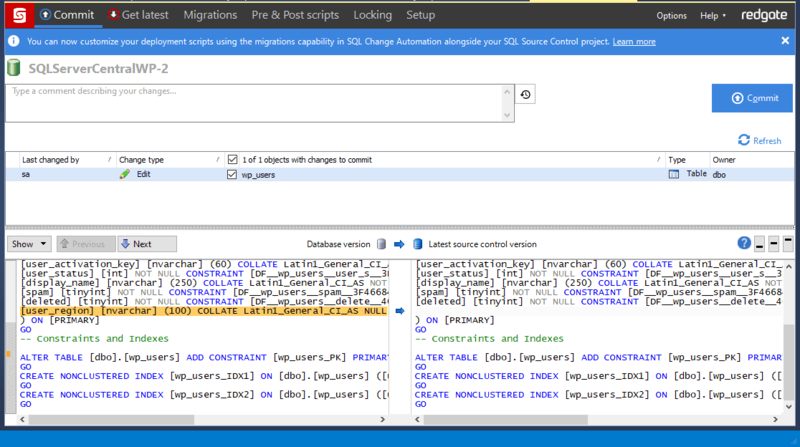 With SQL Source Control you can keep a full change history for your database and every object in it. It shows you who made changes, when they made them, and why. You stay up to date with progress and you get complete oversight of the changes that go into production. A well-documented change management process is also essential to win the trust of auditors or investors. With a complete record of development changes in SQL Source Control, you can pass audits and prove you comply with standards such as Sarbanes-Oxley or HIPAA. Without version control, it’s almost impossible to keep track of development. As teams are growing, it becomes more and more complex to check on progress and work out what work your team has completed. How did your database reach its current state? Who just broke the build – and how are you going to fix it? 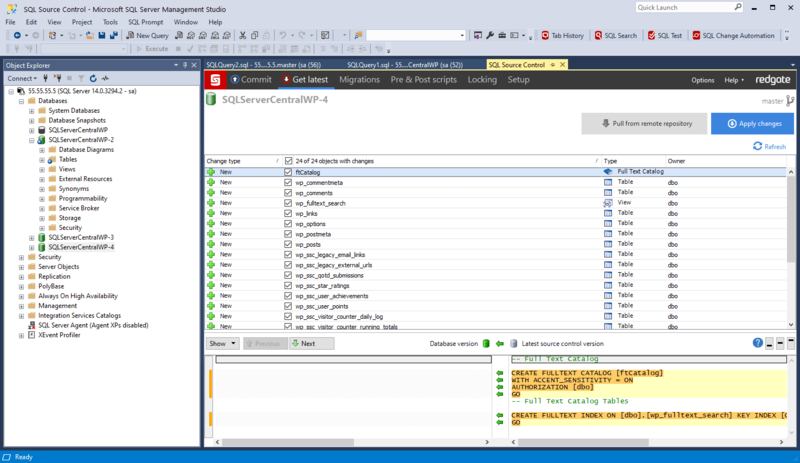 With SQL Source Control you’ll know exactly who made changes, when they made them, and why. You stay up to date with progress and you get complete oversight of the changes that go into production. “Yesterday a vendor made a change to our database which broke some customer extracts. For a close look at database continuous integration, read our 17-page whitepaper Continuous integration for databases using Redgate tools: An overview (PDF). Database version control is hard because there isn’t any source code. Instead, your queries change the state of the database. SQL Source Control solves that problem by scripting each database object into a file in your version control system. 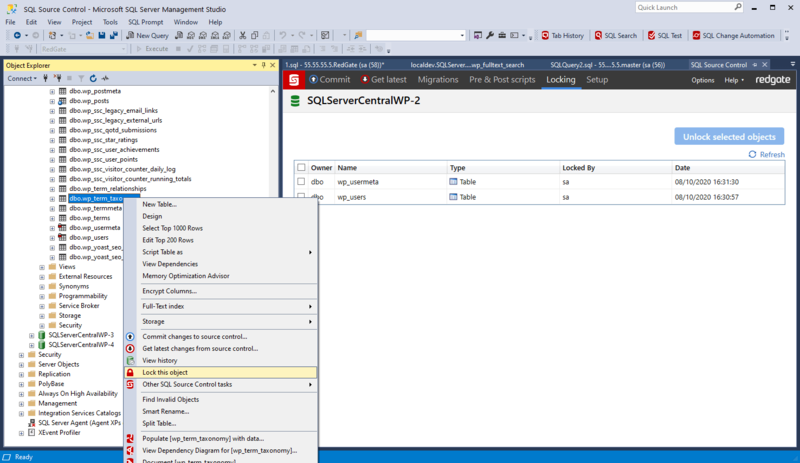 You don’t need to leave SQL Server Management Studio – you can do it all with a few clicks in the Object Explorer. You don’t need to remember to script out your files or instil that habit in new team members. 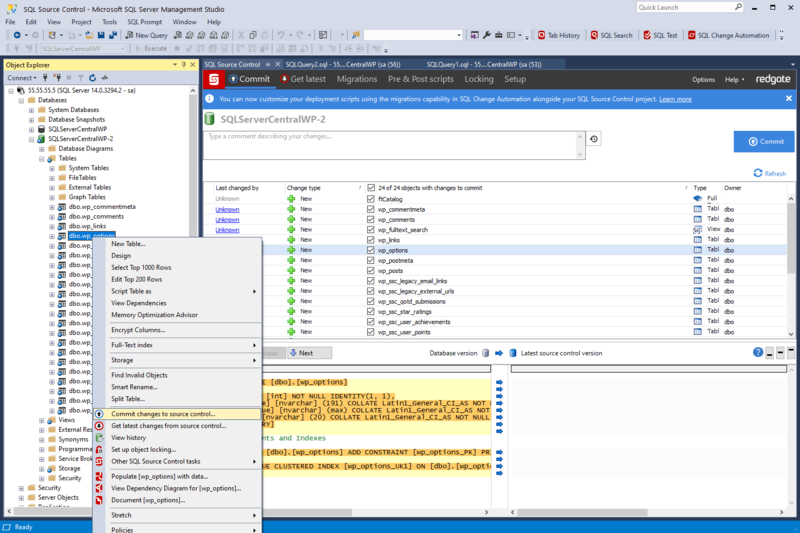 SQL Source Control highlights your changes in the Object Explorer, so you see what’s sitting outside version control at a glance. You don’t have to worry about referential integrity or data persistence. 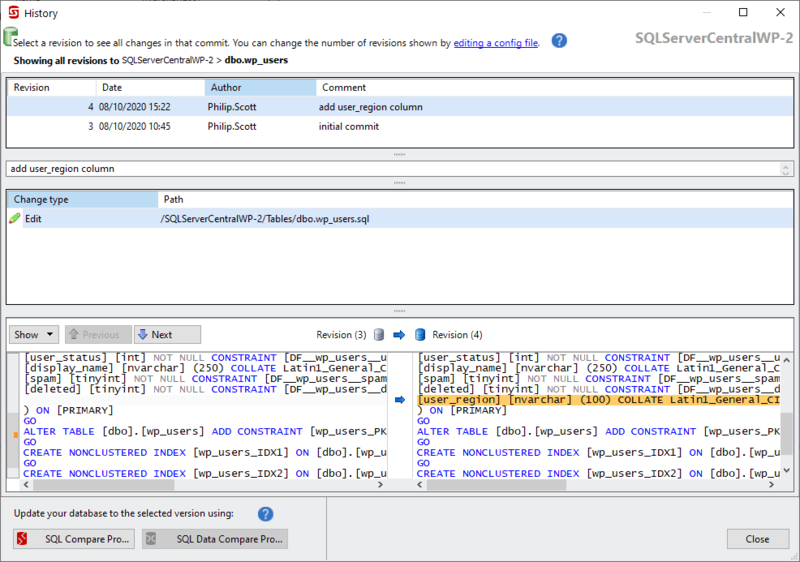 SQL Source Control sorts out the order of your changes and deals with keys and constraints for you. With migration scripts, you can specify how to deal with complex changes that affect your data, such as table splits. When you’ve made your changes, you check them in with a couple of clicks, just like you would for your application code. SQL Source Control scripts out files that represent the new state of each object and saves them in your version control system. Not only is it simple to share your work – you also have a history of every change to every object in your database, along with details of who made each change, when, and why. “Before using SQL Source Control, we'd tried a whole bunch of things. Sometimes we passed around manual backups, or SQL CREATE scripts, but that meant only one developer could work on the database before we had to issue updates again. We tried Database projects in Visual Studio, but they were clunky, and rather fragile when we made substantial changes. One of our developers eventually cooked-up his own sync tool. It was a time consuming project. We had to teach new developers how to use it, enforce certain conventions, and it only really worked when source and target could be accessed at once, which wasn't often. “After using SQL Source Control for several months, I wondered how I got by before. The ability to instantly keep database structure in synchronization across development, test, and production environments instantly reduced the amount of work and potential for error. “I can push things out faster and free up time that used to be used for manual setup and testing. Less bugs for customers, less downtime, more stable and reliable software. “If you assume that each developer saves 15 minutes per day of productivity (that is a conservative estimate), then 1/32 (15 minutes / 8 hours) of their salary is recovered. If the average developer salary is $80,000, then this by itself translates to a benefit of $2500 per year. Got a question about SQL Source Control? We're here to answer them. Get in contact or check out the documentation site. Release straight from your repo, or kick off CI builds, with the industry-standard products for SQL Server development, deployment, backup, and monitoring.